The whole valley in which the farm lies was called Dragonsdale in ancient times, before the dragons were domesticated, and retains the name. Where Cara and her father live. It has a large kitchen with a big wooden table. It is always warm, because of the black wood-fired range and constantly boiling kettles, fresh baking etc. The household is run by the housekeeper, Gerda. Large cobbled area surrounded by the various buildings of Dragonsdale. It can be reoofed with canvas for the Yuletide celebrations. Stone buildings, clay tile roofs on bog-oak beams. Contain no straw as dragons would burn their own beds if it were used! Instead dragons lie on beds made of pumice in individual stalls or boxes. These have horizontally split iron doors - smaller at the top, larger at the bottom, and brass name-plates for dragons resident at the stud above the doors. In the Northeast corner of the stable yard – a lookout point for beacons calling for help from Dragonsdale and spotting the arrival of visitors. Contain incubation pens with a hypocaust heating system to keep the dragon's eggs warm on a bed of sand until they hatch, and pens for the dragonets, which remain here until they become yearlings. Where the stable hands live. Resident riders live in Dragonsdale House. Where Wayland the Forgemaster works at his furnace. This lies in the centre of the stable yard. 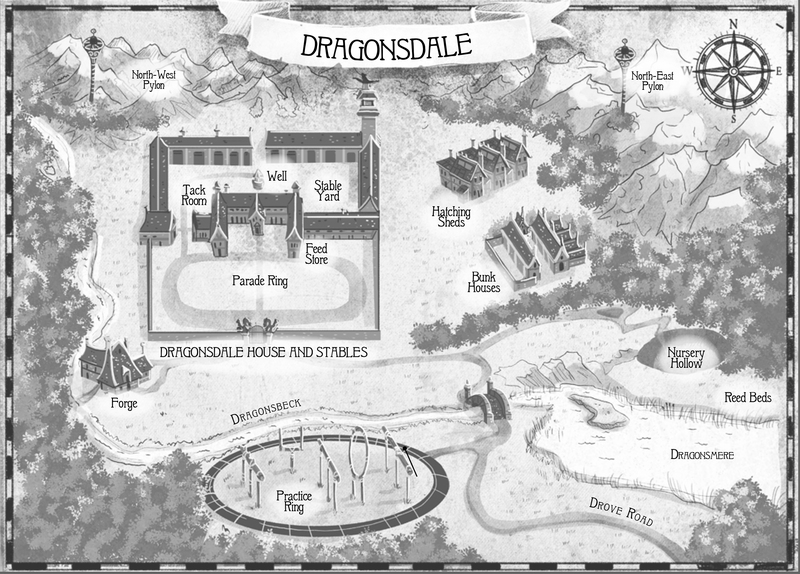 The lowest part of Dragonsdale, where the youngest riders and their dragons are trained. In front of the house, where dragons are shown off to prospective owners and riders and dragons gather for hunts and other social occasions. A fully equipped showing arena for the ring flying exercises. This doubles as the show arena for local flying events. There are four of these, marking the Northwest, Northeast, Southwest and Southeast corners of the notional “box” used for aerobatic event training. These include: Feedstores, Backrooms, Storerooms. These are used to graze the sheep and goats on which the dragons feed. Dragons also eat plants, sometimes from this pastureland, but more often from the swamps and bogs of Lakeland to the North. *including private owners and their dragons kept at Dragonsdale. The Guard flight doubles as the hunting flight when not required for guard duty. In an emergency, any sufficiently competent junior or any senior rider can be called upon to augment the guard flight.